This hostel has a large gardens, the property is divided in 4 constructed areas independent from each other, and the property also has common areas, such as the kitchen and living room, 1 in the main house and the other below the Bamboo Studio. In total it has 9 rooms, 5 rooms that share a bathroom in one of the constructed areas; 3 rooms in the main house, they share 2 bathrooms. And a Bamboo Suite. This is a quiet and private big place. It offer reasonable rates for guests that decide to stay for a week or a month. It has a big swimming pool, and a grill next to the swimming pool, so any day has the possibility to become a FunDay for the guests. Also, it's only a few steps away from the surf spots La Bocana and El Sunzal. ​Playa El Tunco, Km 42.5 Litoral Route, Playa El Tunco, Municipally of Tamanique, Departement of La Libertad. ​The hotel offers surfing lessons and rents surf equipment. You are able to practice yoga in a studio that's a couple properties away from the hostel. Transfers from and to the airport, or bus stations in San Salvador are available. Spanish lessons are also available. It offers surf tours, and various other tours that can be guided in Spanish, English, Dutch or German. 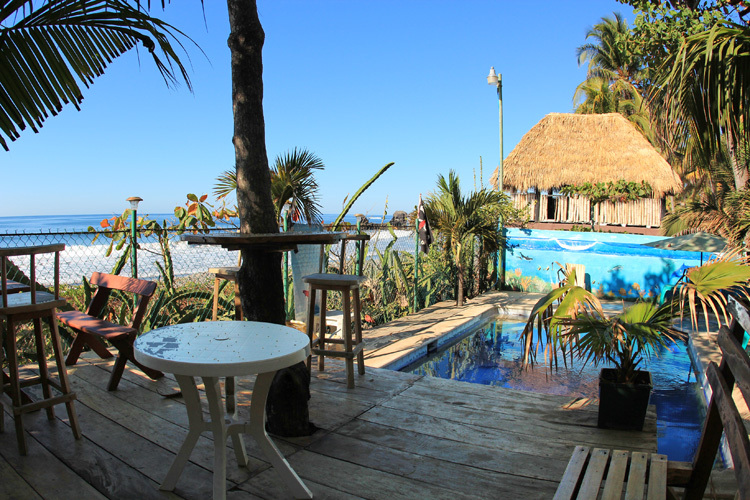 Comfortable hotel with 5 rooms, swimming pool and wi-fi, in Playa El Tunco. Double room with fan or air conditioning. Right on the beach! What used to be a surfboards factory, it's now a hostel for guests looking for peace in a private place, away from the noises from the usual weekends, but at the same time close enough, a 5 minutes walk to town's bar/restaurants area. It offer rooms equipped with a fan a large bed. Rooms share bathrooms. Also offers a Bamboo Suite with a unique asian design that overlooks the river and the entrance of La Bocana. US$45 "Bambo Studio" (2 persons).